Last year, Razer introduced its first-ever smartphone and, as you might've guessed, it was built for gamers. With a 120Hz screen refresh rate, a gorgeous display and a powerful processor, the Razer Phone was definitely impressive when it came to trouncing virtual opponents on-the-go. Yet, it remained a tough sell for the mainstream audience, thanks, in part, to its less-than-stellar camera. Today, the company is ready to announce the Razer Phone 2, which promises to have addressed all the shortcomings of the original, and more. It's not only a better gaming phone, proclaims Razer, it's a handset worthy of flagship status too. At first glance, however, it might not seem like much has changed. The Razer Phone 2 is just as bulky as the original, with squared edges and sharp corners. This, according to Razer, is simply part of the brand's aesthetic. "If you look at our laptops, and you look at our phones, they share the same DNA," said Michael Breslin, Razer's head of sales and marketing for mobile, to Engadget. "We're proud to have hard edges." 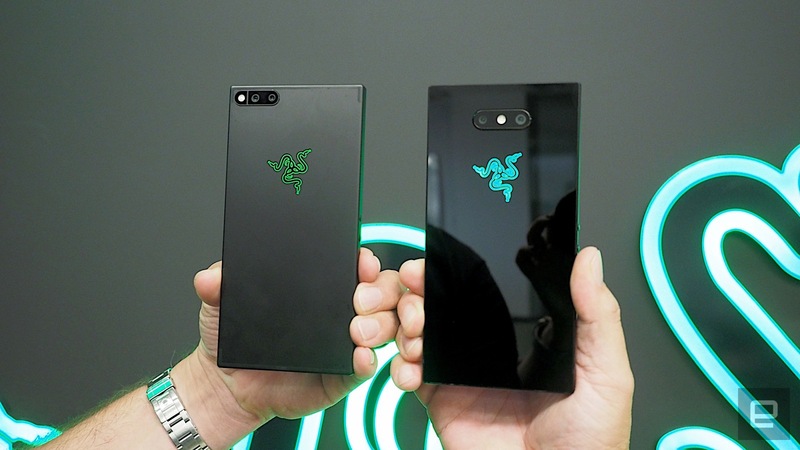 It's not my style at all -- it doesn't feel particularly comfortable in my hands -- but I appreciate Razer's commitment to branding here, which draws a bit of DNA from Nextbit as well. Look a little closer, though, and you start to notice a world of difference. Take the display, for example. It looks like the same 5.7-inch IGZO LCD display, and yes, it still has that 120Hz screen refresh rate but this time around has been boosted with deeper blacks and crisper colors, thanks to a wider color gamut. In a demo, I watched a clip of Black Panther on the Phone 2 side-by-side with the original, and it was evident that the display on the new model was more vibrant. The Phone 2's back is now clad in a mirror-finish glass, which is in line with flagships like Apple's iPhone XS and Samsung's Galaxy S9 devices. It's certainly flashier than the boring gray aluminum on the original, which I wasn't' a fan of. Razer tells me there'll be a premium "satin black" finish of the Phone 2 that is even smoother and silkier in appearance, but I didn't get a chance to check it out during my demo unfortunately. A fun detail with the Razer Phone 2 is that the logo on the back actually lights up, a common feature in most of Razer's products (especially its laptops). You can set it to one of 16.7 million color options, enter a "breathing" mode where it fades in and out, or fire up a spectrum mode where it goes through various colors. This, amazingly, is perhaps the most requested feature from Razer fans, said Breslin. Another interesting feature with the chroma logo here is that the color can change for different kinds of notification you get. So, for example, if someone sends you a message in Outlook, the logo will glow blue. Or if it's Gmail, it would be red. The software is smart enough to pull the base color from the app's theme and uses that for notifications. Of course, you're bound to get multiple apps giving the same color notification (Yelp and Gmail for example) but Razer says that's still providing more information than a typical indicator light. Perhaps the most common complaint about last year's Razer Phone was its mediocre camera. 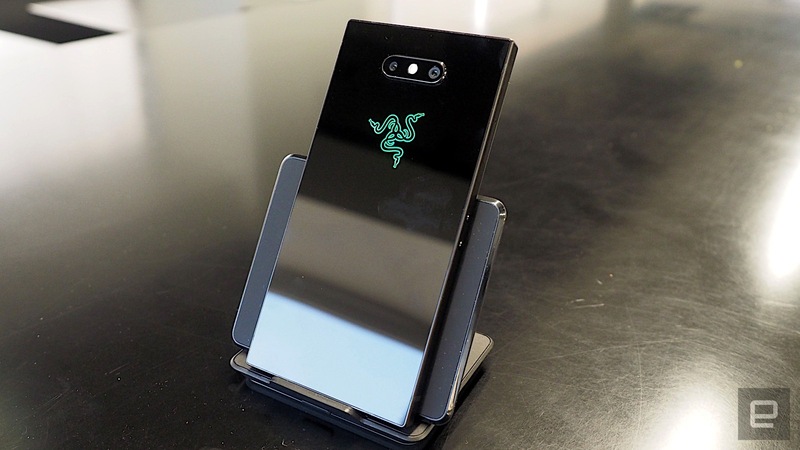 The company obviously listened, because the camera in the Razer Phone 2 has been redesigned from the ground up. The broad strokes are still the same, with a 12-megapixel dual-lens on the back and an 8-megapixel front-facing camera -- but everything else has changed. Razer switched from Samsung to Sony sensors, improved the lenses and threw in optical image stabilization for good measure. It also shifted the sensors apart, which Vivek Gowri, Razer's senior manager in hardware engineering, said allowed the cameras to get better depth information. The software algorithms have been improved as well -- all of the HDR, autofocus and low-light processing capabilities were redone. "We basically started from scratch," said Gowri. "Nothing was carried over from the first-gen. That was something that we consciously recognized we had to change in order to be truly flagship level." I wasn't able to give the camera a thorough examination during my demo, but it did look a little improved over last year's. Photos looked brighter and crisper, at least in the brief few minutes I had with it. There appear to be a few software enhancements on the front-facing camera, too, like a portrait mode and beauty filter for better selfies. Shutter speeds seemed quicker too. These aren't unusual features for phone cameras these days, but they do make the Razer Phone 2 more competitive with other modern flagships. Of course, we can't talk about the Razer Phone 2 without talking about performance. Thankfully, the company didn't skimp here. It's loaded with Qualcomm's Snapdragon 845 processor with an Adreno 630 GPU and 8GB of RAM. Combine that with the super-smooth 120Hz screen and I felt very little noticeable lag, even when playing games like Forza Horizon 3 and Tekken 3. One interesting change that Razer added to the Phone 2 was its very own vapor chamber cooling system, an idea taken from its laptop line, shrunken down and placed into a smartphone. "Typically in the past, we would be using a heat pipe, which is a thin strip that moves heat from one point in the phone to the other," said Gowri. 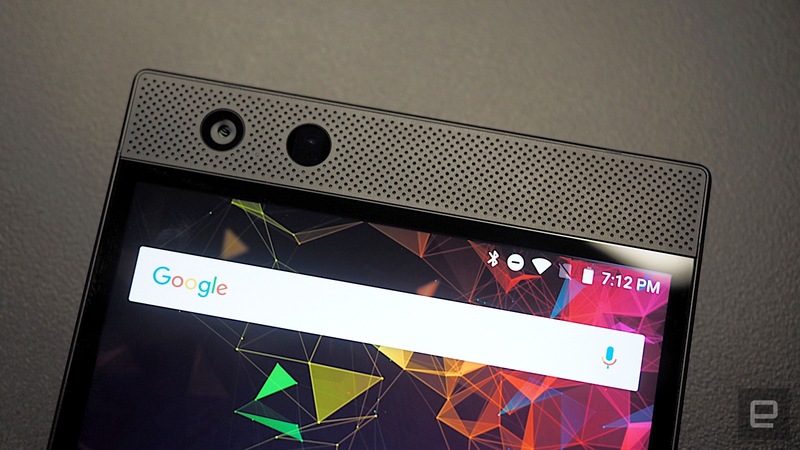 "With the vapor chamber, we're able to spread the heat across the entire surface of the phone." This, he said, helps keep frame rates high and temps low. Compare that to other phones, where -- once you hit a certain temperature -- performance is generally throttled. "We don't do that," said Gowri. "People are not playing these AAA titles for five minutes; they're playing them for 30 minutes or more. We need the phones to run at high levels of performance at extended periods of time." On the software side, Razer is introducing a new Cortex app helps you organize your games and makes recommendations based on your performance and the type of game you like. It'll highlight games optimized for 120Hz screens, and yes, it retains that game booster mode from the last Razer phone (that lets you customize the optimal game settings for). You can go in and tweak individual settings like CPU, resolution and FPS as well. Just as before, the Razer Phone 2 comes with Atmos-certified Dolby audio processing , a 24-bit DAC and dual front-facing speakers, which come together for a really immersive surround sound experience. I had a demo where I could actually hear the music move around my head, which is a feature I imagine is especially useful in games because now you can hear footsteps creeping up behind you. The speakers are loud, punchy and not grainy at all -- even at high volumes. The Razer Phone 2 has other small yet significant features that bring it up to par with other flagship phones. It's now IP67-rated to be water-resistant for up to 30 minutes, and it also supports Qi wireless charging. If you do plug it in to charge, the Phone 2 supports Qualcomm's QuickCharge 4+ that will bring it to 50 percent life in just 30 minutes. It also has a 4,000 mAh battery (unchanged from last year's Razer), so you should have a solid day of gaming and entertainment ahead of you. With all of these improvements, it's clear that Razer wants its handset to be more than just a gaming phone. "This is a daily driver phone," said Breslin. "That's really our goal. Flagship gaming is our tagline." Yet, Razer die-hards likely don't need a lot of convincing, as they probably thought the original Phone delivered what they needed already. What Razer needed to do was draw in those who weren't sold they needed a phone just for gaming. And all of these extra features -- better camera, water resistance, and that Chroma logo -- could be enough to convince them that a gaming phone could be great for everything else too. The Razer Phone 2 with 64GB storage will be available for $800, with pre-orders starting tomorrow. There will also be a premium Satin finish option with 128GB for about $100 more.